Grand Theft Auto V is a game that does not get off on the right foot at all. The intro tutorial is a complete mess. Remember how in Grand Theft Auto IV, the protagonist was introduced in a cutscene during the opening credits? We learn about his personality and motivations, and why he is coming to America. Then you get off the boat, gameplay begins, and you are immediately given a simple driving tutorial in which you taxi your drunk cousin two blocks to his shithole apartment, all the while learning more about the characters and the game world itself. Then you do some simple taxi missions that let you practice driving while simultaneously letting you learn the layout of the city and soak in the environment. Then you start getting asked to beat people up and throw bricks through store windows and get tutorialized on how to fight, shoot, and do other advanced mechanics. And during all this time, the game slowly builds up a hatred and distrust for the criminals that you are working for while simultaneously laying the foundations of the game's depressing-but-exceptionally-introspective plot. Remember all that? Remember how well that game was paced? Remember how the tutorials always showed up at appropriate times, explained a mechanic during non-interactive cutscenes so that you can pay attention to the instructions, then lets you practice the mechanic while it's fresh in your memory? Remember how well it slowly built up the important mechanics one at a time - as they became relevant - while also immersing you in the game world and building up its story to a climactic closing of the first act? Yeah, that was great game design, wasn't it? Well, GTA V has none of that. 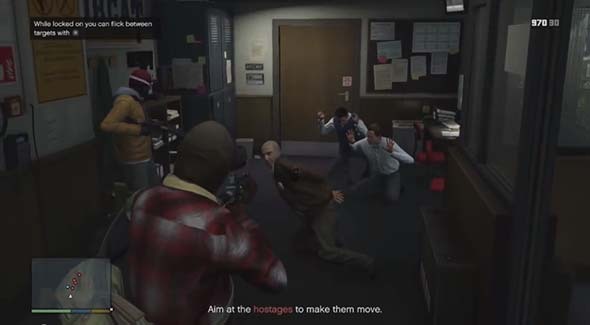 The intro tutorial literally throws the player into the middle of a bank robbery in progress. 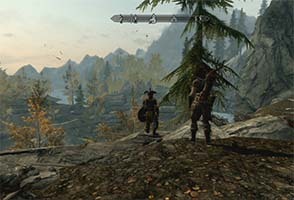 You have no idea who your character is, why he's robbing a bank, who your companions are, or what the "plan" that everybody keeps telling you to "stick to" is. Then it puts an assault rifle in your hands, and a tiny little box pops up in the corner of the screen with 6-point font telling you what to do while you're trying to do the thing that it's telling you to do - and hopefully not doing the wrong thing. And then they stick you in the middle of a gunfight with an entire small army of police, and these barely-visible text popups try to tell you how to use the cover mechanics, switch weapons, and trigger super powers - all while you're being shot at. Then you go for hours before using many of these mechanics again, so you forget them all because you had zero time to practice and remember them, and they were all thrown at you at once. This review was originally published 06/29/2010 on Game Observer (now defunct as of 05/13/2014). It has been republished here for archival purposes. The marriage of Wild-West theme with open-world gameplay is a great idea, but Red Dead falls just short of "genius." I was very impressed with Grand Theft Auto IV. Before the game had come out, I worried that the formula would be stale, and that Rockstar would just throw so much content into the game that it would overwhelm the player (San Andreas was a ridiculously complex game, although not in a bad way). The successfulness of Grand Theft Auto IV had me very excited about Red Dead Redemption, even though I hated its predecessor Red Dead Revolver. The release of this game also made me realize how strangely devoid the gaming world is of Westerns. I guess game developers just didn’t feel the genre would be very popular with the younger audience. But Red Dead Redemption just might change that. 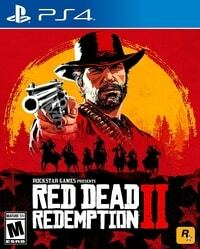 The marriage of a Western theme and an open-world sandbox style of gameplay is a combination that seems absolutely genius. Red Dead Redemption, however, does not quite reach the level of "genius." Don't let Red Dead's expansive environment and minimalist soundtrack fool you into thinking that it will have the almost-depressingly-desolate brilliance of Shadow of the Colossus. There's a lot more than just birds and lizards in New Austin, and they'll pop out of the grass to eat you alive sooner than you can spit. 'Max Payne 3' shows that Rockstar can keep the series thrilling! in Video Gaming | Game Reviews by Huh?Mr.Box! Let me preface this review by stating that I’m a big fan of the Max Payne series and film noir in general. Both Max Payne and Max Payne 2: The Fall of Max Payne had adrenaline-fueled, symbolic, dark, and quite often funny parts of awesome whole experiences. I strongly suggest playing at least the first game if you haven’t already; its story is great and definitely gives you a feel for who Max is and why he keeps on fighting through many odds. But while the old games are great, they don’t quite reach the level of fun that I found in Max Payne 3. Max Payne 3 is a fantastic game. 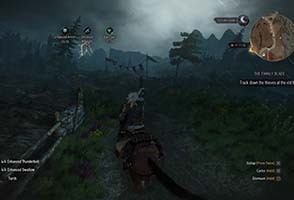 Right when I started playing I knew that it was a great decision because of the top-notch production values which include the graphics, sound design, and direction of the plot. One of my favorite things about the game is that it has a very self-contained experience in that you don’t have to play the previous two in order to fully understand it. However as stated before you will empathize with and enjoy Max as a character much more if you’ve played MP1 and preferably MP2 as well.